For a long time, I wished there is a simple way to increase font size in Windows so that it will be a bit easy on my eyes. Sure, we can increase font size using some registry tricks but that is not user-friendly or viable in the long run. That all changes with the October 2018 update. Among all the other new features, you can now enlarge system font size in Windows 10 by simply dragging a slider in the PC settings app. No need for any tricky registry changes. The good thing is, once you set font size it will be applied system-wide. System, first-party, and third-party apps will have proportionally increased font size, as long as the apps are using system font settings. This is completely different from DPI scaling which increases the size of everything on your screen. The new option will only increase the font size. 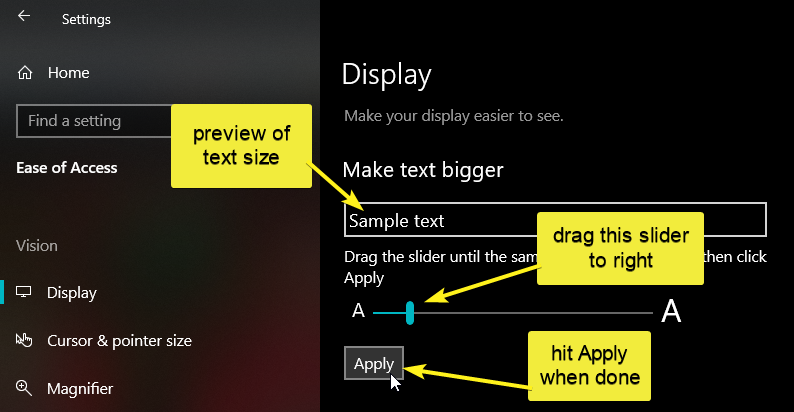 Without further ado, let me show you how to increase system font size in Windows 10. To increase system font size in Windows 10, you should have October 2018 update (v1809) or higher installed on your machine. If you don't know, you can verify that easily by checking the Windows version number. The simplest way to know what version of Windows you are using is to use a run command. Press Win + R, type winver and press Enter. In the About Windows window, see the second line. It should say "Version 1809" or higher. You can safely ignore the OS Build number. 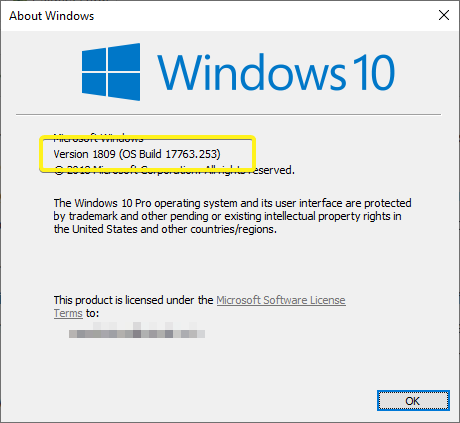 Unlike the version, the OS Build number will change every time you install a Windows update. You can increase Windows font size using the Ease of Access page in the PC settings apps. 1. First, open PC Settings app by pressing the keyboard shortcut Win + I. Now, go to the "Ease of Access" page. 2. In the ease of access page, select "Display" on the left panel. On the right panel, you will see a new option called "Make text bigger". Under that, simply drag the slider to increase font size. 3. Helpfully, the settings app will show a preview of the font size. Once you have the desired font size, click on the "Apply" button. Windows will instantly apply the new font size to your entire system. Personally, I try to keep around 70 centimeters to 80 centimeters distance between me and my computer screen. For that distance, 110% text size looks just perfect. But your mileage may vary depending on the screen size and resolution. So, I encourage you to try different font sizes to find the perfect fit for you. Generally, if you have vision problems or for elderlies, I recommend using around 125% to make reading text easier on your eyes. Though you can see the changed font size across Windows almost instantly, you might want to restart applications or the Windows system to apply the new font size properly. This because the applications that are working in the background cannot be updated with the new font size while they are being used. To revert back to default text size in Windows, just drag the slider all the way back to left (100%) and you are good to go. Again, restart your system to apply the changes system-wide. Hope that helps. Let me know what font size you are using for Windows system font and to what size you've increased the system font in Windows 10. Also, check out how to change OEM information in Windows and how to delete clipboard history in Windows 10. It seems this feature makes text bigger only for MS Store Apps, which were always oversized anyways. All other native Windows programs remain unchanged… heck, even all the system dialogs and context menus remain unchanged with the tiny 9pt font. Why Microsoft can’t do any single feature about font scaling properly? The only usable dialog to adjust font sizes gone away with Win10 Creators Update and since then, the only option is to use the tedious registry hacks to set the desired font size. Also the feature to adjust the overall screen scaling is a joke as well, when you are allowed to choose only from scales with 25% increment, not mentioning the problems with blurry fonts in some native programs. And the only thing I wanted to achieve was to change the system font size from 9pt to 10pt, but perhaps that’s too much to ask from this operating system. That is odd. I’ve used this feature my self and I can see that the font size has been increased in all apps, including the good old win32 apps. However, if the app developers choose to use their own font size settings then that font size may not increase or decrease as they are not following the Windows recommended practices. For instance, a free application called Speccy is unaffected but Google Chrome scales the font according to your ease of access settings. I’ve tried Chrome and you are right, it scales up, but only partially (tabs, address bar and web content are scaled up, but all other fonts like in context menu or favorites bar remain unchanged for me). Can you please name some win32 programs that scale up like you mentioned? When I look at Windows system tools like Device Manager, Disk Management, Control Panel, etc… there is no effect at all. The same with MS Office 2016 and all other 3rd party programs like Notepad++, Firefox, Qt Designer, FreeCommander, etc, etc. The most sad thing is the only settings that enabled us to set both font size and font family, which were included in Windows since I remember (definitely since Windows 95), gone away with Win10 Creators Update, and of course silently without any proper replacement. I don’t know if I’m the only one, but Windows feels more and more inconsistent to me. We have the Store Apps and the new Settings, which are all ridiculously oversized with huge fonts… and on the other side all the system tools and system dialogs are so tiny, almost impossible to read and there is no way to set all the dialogs to have a similar font size. I’ve tried to upgrade another computer to Windows 10 1809 and it seems the feature *Make text bigger* works much better there. Now really most of the system dialogs have bigger fonts! (don’t know why it didn’t work on my notebook). 1. Only one slider value for both MS Store and Windows System fonts (my problem with Win10 is that all the MS Store Apps are oversized, while system dialogs too tiny). 2. Compared to previous Windows, we still can’t customize font family and sizes for various UI elements. 3. It seems the feature *Make text bigger* just tweaks the registry values in `HKEY_CURRENT_USER\Control Panel\Desktop\WindowMetrics`. So. there is no significant improvement compared to known registry hacks. I think it takes some more time to iron out the issues and make things good. They are getting there, but very slowly. We should remember that Microsoft cannot go all out with customization as they have to think about backward compatibility which spans decades.